"Demon, Official Beastkeeper to the Gods, is transported to the stables under the sea in Poseidon's watery kingdom"
Taking care of the stables up on Mount Olympus is one thing, but when Poseidon, god of the seas, takes Demon to his underwater realm to cure some sick hippocamps, the young stable boy is pretty fed up. Doris the Hydra can't be trusted to tend to the beasts, how will he breathe underwater . . . and what in Zeus's name is a hippocamp anyway? With the help of his magical medical box Demon manages to cure the sea horses of their scale-rot, but when Helios orders him to the Stables of the Sun because one of his steeds has gone lame, Demon realises he's about to get caught up in a feud between water and fire . . . The third in a delightful action-packed four-book series from acclaimed writer Lucy Coats, who uses her original and funny voice to bring to life the gods, goddesses and beasts of the ancient Greek pantheon. 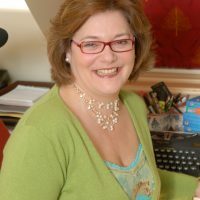 Lucy Coats is the author of more than 30 books for readers of all ages, including ATTICUS THE STORYTELLER'S 100 GREEK MYTHS, which was shortlisted for the Blue Peter Book Award. She began her storytelling career as a bookseller, editor and journalist, and has been fascinated by myths and legends ever since she can remember. Lucy is a book reviewer and blogger as well as active on social media. She lives in deepest South Northamptonshire with her husband and three unruly dogs. When she is not writing, she cooks, grows vegetables, and sits in her stone circle, looking at the stars. Follow Lucy at www.lucycoats.com or Twitter: @lucycoats.